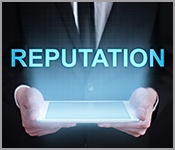 How can you ensure that your institution’s reputation positively impacts business results? What patients think about their stay – from admission to treatment and actual therapy to the discharge process, dietary plans, rooms, and the communication with physicians – is reflected in quality rankings and patient satisfaction scores. Patients also influence referrers – and vice versa. Either way, negative patient satisfaction scores have a negative impact on an institution’s profitability. In addition, the public perception of a health-care provider strongly influences its standing as an employer on the job market.